Super-TIGER on the Ice: How did I get here? 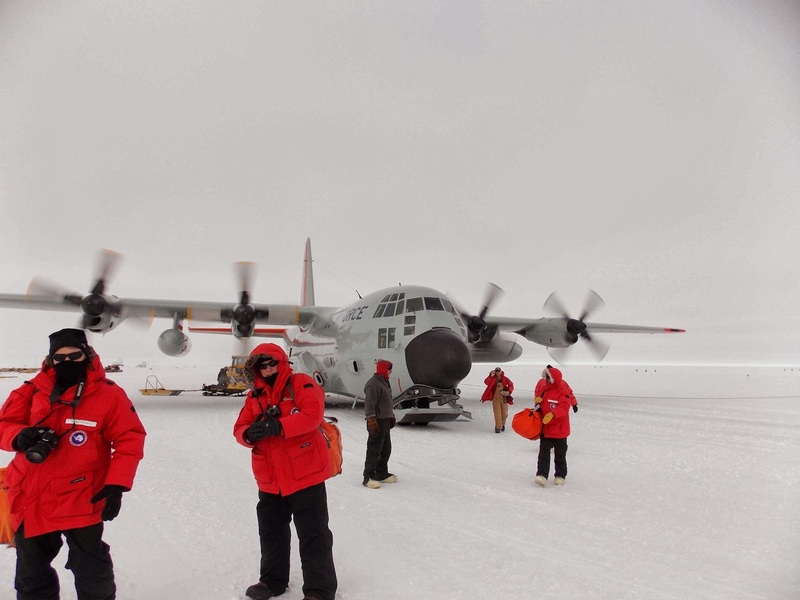 It has been over a week since the team landed at the South Pole. We have settled into a routine of eating, sleeping and waiting for our flights to the payload. Weather, as always, is an issue. I wanted to briefly recap how we got here, and what we found when we arrived. The journey from McMurdo to here was very uneventful and dare I say it pleasant. We flew on an LC-130 flight from Pegasus airfield (about an hours ride from McMurdo station) which took about 3 hours total. These Pole flights are generally not as full as the inter-continental flights, leaving lots of leg space and room to walk about if needs be. 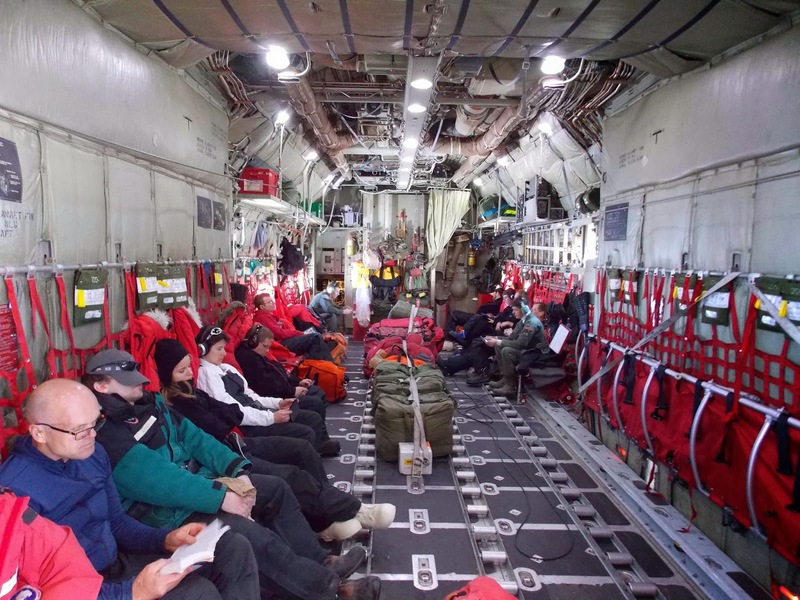 Disembarking the plane at the skiway at the South Pole was certainly a colder experience than when we first arrived on the continent this season. Stepping into -25C with a windchill of -30C was certainly more like the Antarctic experience I recalled last year when landing in McMurdo in late October. However, we were soon told that it was reasonably warm at the pole that day, and generally the temperature during the summer here is nearly always around -30C (~ -20F) with a windchill around -40C (~ -38F). Regardless, I was well motivated to move rapidly indoors, only pausing to snap a quick pic of our ride here. Grant and John Mitchell in action pose. The view was also something vastly different. The South Pole is on the Antarctic plateau, which is a featureless floor of white as far as the eye can see. No mountains or smoking volcanoes to break the horizon, only the Amundsen-Scott research station, a few outlying buildings and lots of cargo crates. 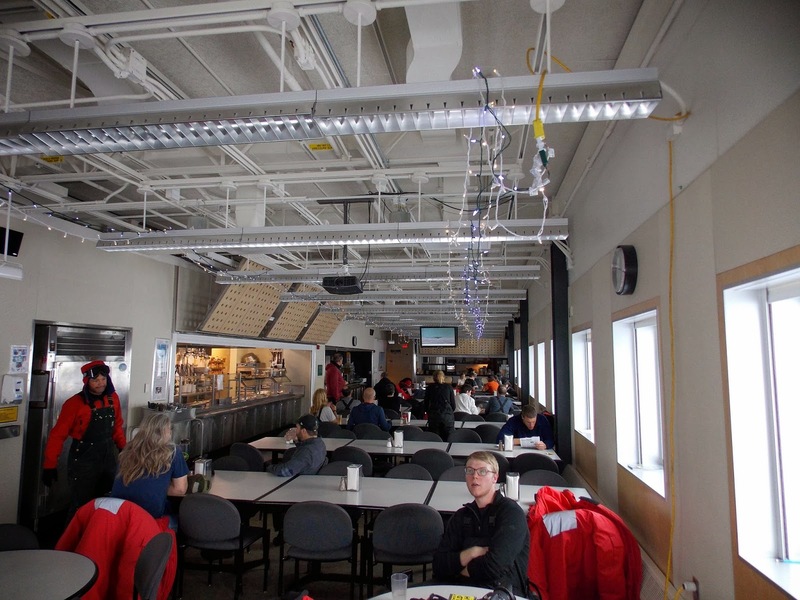 Once inside the station, we were brought to the galley where we watched an orientation video to accustom us to the life at the Pole. The sensation here is much different to McMurdo. 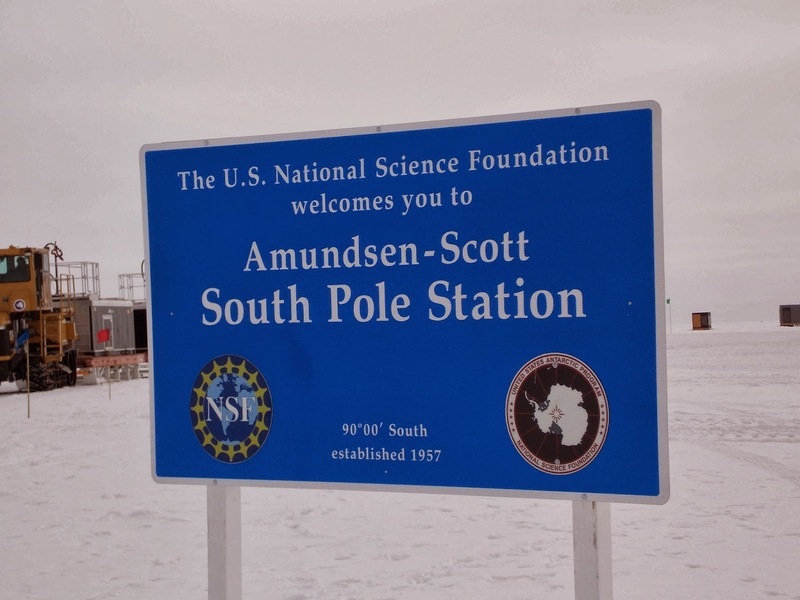 While "MacTown" has the feeling of a mining town in the summer, Amundsen-Scott has the feeling of a space-station or a submarine. All the combination of steel stairways, long corridors with metal pipes and wires and thin windows looking onto a lunar surface give it that science-fiction feel. The galley: Where I will spend about 80% of my time. 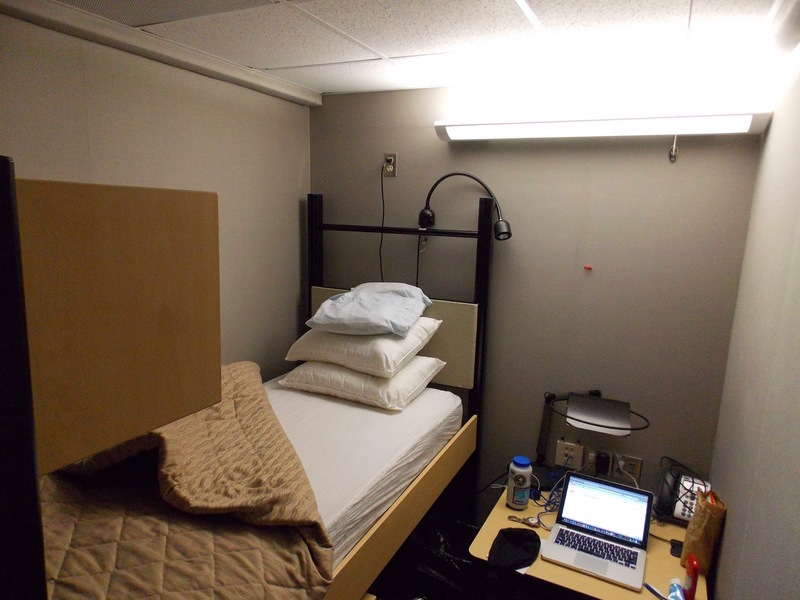 The population of the station is about 137 at our arrival, and we all have individual rooms which is a nice change from the shared dorms of McMurdo. The rooms are small and mine didn't have a window, but I am happy to have a little place to call my own. I have a suspicion prisoners may express the same sentiment when first shown to their cells however :). To conserve water at this remote station we are allowed two, two-minute showers per week along with one use of the washing machines for laundry. The bathrooms for our "berth" (dorm area) are cleaned by the occupants of that berth. On the inside of your room door is a day, that is the day you are a "house-mouse", in charge of cleaning the bathroom. Myself and Thomas have Thursdays, and to be honest, it's one of the more satisfying things you can do on the station! You get into a rhythm of cleaning and actually see the sparkling results in the end. That is one of the only certainties you can claim on this continent (provided you do a good job of course). Otherwise, I spend my time eating, reading, partaking in whatever recreational activities are going on and staring stoically out the window at the plateau. The internet is provided by passing satellites and so is only available for specific windows per day, naturally it is not extremely speedy so uploading pictures (and writing blogs) can be hit or miss. However, soon I will upload my next posting: A Tale of Two Poles.